It's beginning to look a lot like the holiday season and time to take advantage of all the great sales going on so you can be ready for the gift gifting season. 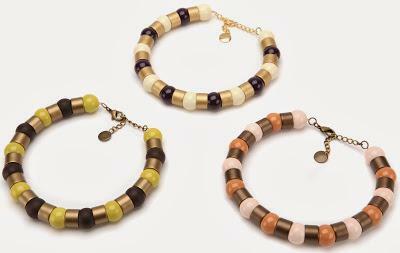 Is there someone on your list that loves jewelry and accessories? 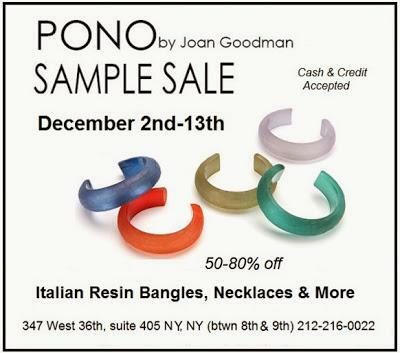 Then you should definitely check out the PONO Jewelry Sample sale. Pick up gorgeous gifts and beautiful baubles with a trip to PONO’s annual Holiday Sample Sale where everything is 50-80% off. 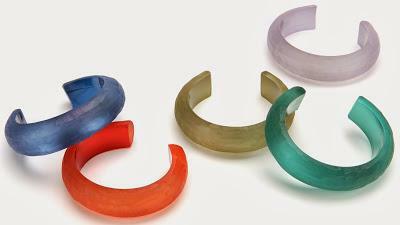 Meet designer, Joan Goodman and select from her accessories like the Italian resin Colorful Cuffs (now only $10.00, originally $50.00), Go tone on tone with their Masai Necklace (now $75.00 from $205.00), or get deco with the Cleo Necklace, once $265 (now $75.00 from $265.00). Don’t forget to gift something for yourself, maybe the breathtakingly bold Colorblock Choker (now $40.00 from an original $205.00). The sale runs from Mon 2–Dec 13, 9am–6pm. and is located at 347 W 36th St. suite 405, between Eighth and Ninth Aves. Subway: A, C, E to 34th St. (212-216-0044, ponobyjoangoodman.com).